So it was the second game of the four game series as the Quakes are at home to play against their California League rivals, Inland Empire 66ers. 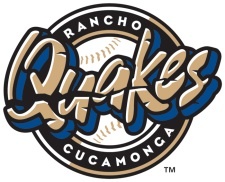 The Quakes are the minor league team for the Los Angeles Angels of Anaheim and the 66ers are the minor league team for the Los Angeles Dodgers. Now that we have the formalities out of the way let me share with you what that game was like. It was like the Titanic sinking quick and the 66ers were definitely the iceberg and the Quakes were of course, the Titanic. The 66ers scored 10 runs in the first inning of the game. It wasn’t that the Quakes were in denial of the 10 run inning, but the scoreboard read zero. Not zero because they were poor sports, but the inning by inning line score on the scoreboard could only do single digit numbers. We were out at the game Sat. night and will post highlights of the game. The final was eventually 16-5 and I took off around the bottom of the sixth inning after the 66ers scored another five runs to take the 16 to five lead. I feel bad that the Quakes could not pull this game out. It was such a festive night too. The team wore their camouflage jersey tops in honor of military service night at the ball park, there was a spectacular fireworks show waiting for those who did stick around and the weather was gorgeous. In fact, the crowd of 5,145 were all excited until the 66ers offense started their version of the big bang fireworks display with their bats. For the 66ers to be in dead last place, it makes me wonder how that is possible when they are dominating the Quakes as they have in the last two games with two more to go. It will be interesting to see what happens. Are you a Quakes or 66ers fan? Did you go to any of the games? Tell me your thoughts because I really do think the match-up between these two teams is lopsided with the 66ers taking the advantage. Oh yea, and of course….the mascots, Tremor and Aftershock did do their best to keep the crowd entertained, but when you’re down by 11 before the seventh inning stretch, its gonna be tough to keep anyone interested. Previous Previous post: Sportscenetv.net goes mobile!